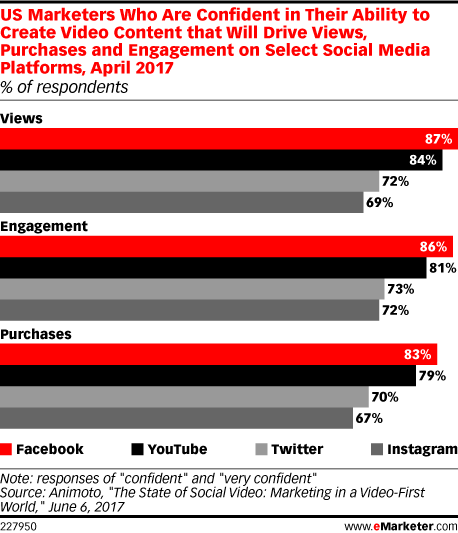 Data is from the June 2017 Animoto report titled "The State of Social Video: Marketing in a Video-First World." 566 US marketers and 1,070 US internet users ages 18+ were surveyed online during April 6-11, 2017. For the marketer survey, respondents identified the number of employees at their company as 3-9 (5.3%), 10-24 (10.8%), 25-99 (18.9%), 100-499 (25.6%), 500-999 (15.5%), 1,000-4,999 (14.3%) and 5,000+ (9.5%). For the consumer survey, respondents identified their gender as female (56.4%), male (43.6%) and other (0.1%), and identified their ages as 18-24 (12.2%), 24-34 (23.8%), 35-44 (20.4%), 45-34 (18.3%), 55-64 (17.8%) and 65+ (7.5%). Animoto is a digital video app that is used for the creation and sharing of videos using pictures, video clips, words and music.